Two drug dealers have been jailed for a total of more than 20 years after police spotted them doing a deal in a car park in Birmingham and led to officers uncovering cocaine worth £3.5-million. Dipak Ram and Dean Smith were spotted acting suspiciously around a vehicle parked near flats in Sherborne Street, Ladywood, on March 9. Ram was followed by one officer as he walked off carrying a holdall taken from the car’s boot while Smith was stopped behind the wheel of the Toyota Avensis in Hagley Road. A search of the car uncovered 13kg of high-purity cocaine hidden in the boot – with a street value of more than £1.3-million – and a further 19kg of heroin, cocaine and crack cocaine were discovered in the base of a settee in Ram’s flat. And when officers strip-searched 32-year-old Ram at a police station they found 33 wraps of heroin and cocaine concealed inside his underpants. 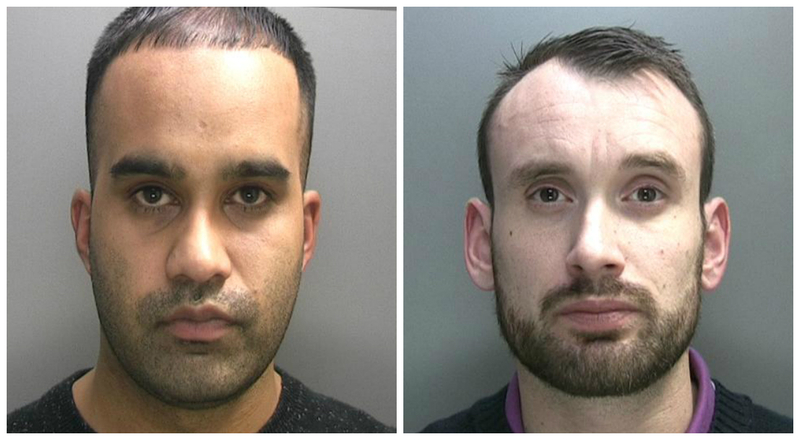 Both men admitted possessing drugs with intent to supply and at Birmingham Crown Court today (Fri 7 Oct) Ram was jailed for 13 years while 32-year-old Smith, from Watford, was handed an eight year sentence. Investigating officer, Detective Constable Kelly Whyte, said: “This was a fantastic piece of good old police intuition. Smith and Ram were spotted loitering around a parked car which had the boot open and their suspicions were heightened when Ram took hold of a bag and walked off. “It acted as the catalyst for us to uncover a huge stash of drugs with a total street value estimated to be more than three million pounds. “This was a professional, sophisticated, wholesale drug enterprise with various drugs, including heroin and cocaine, cut and weighed into amounts varying from street deals up to several kilos. “Both Smith and Ram boasted of their extravagant lifestyles and used the proceeds of their drug dealing to fund trips abroad and buy expensive jewellery. In interview, Smith said he was in debt and had agreed a fee of £1,200 for two drugs runs; he refused to answer questions about the origins of the drugs.